Photo courtesy of Chele Willow. 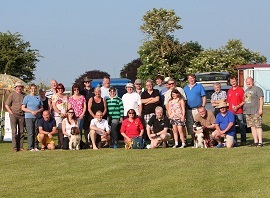 Here are just a few of us in the glorious sunshine of the White Horse Meet at Thirsk, during July 2013. Membership costs just £10 per annum and falls due on the 1st January every year. That's for an individual member or for all family members living at the same address. Benefits of membership include (for the pilots) discounted gas at our meets; (and for everyone) discounted meals at some of our events; access to the members-only area of our website; receipt of our club newsletter, 'Scoop'; pin badges and car stickers with the club logo; also to purchase are custom designed and embroidered sweatshirts and polo shirts. All this for just a tenner, it's a bargain. We have a number of ways you can pay: standing order mandate, bank transfer, cheque or good old cash. Sorry but we do not accept offers of your daughter's hand in marriage, sacks of grain, or any prize-winning pigs! Alternatively you could thrust a nice, crisp tenner into the hand of a committee member at a meet. Or if all of the above fails, you can send a cheque via snail-mail, made payable to 'PRBA'. Please contact membership@prba.org.uk for the postal address.